* Renovations to the kitchen, living room, and bathrooms have just been completed. Updated photos coming soon! 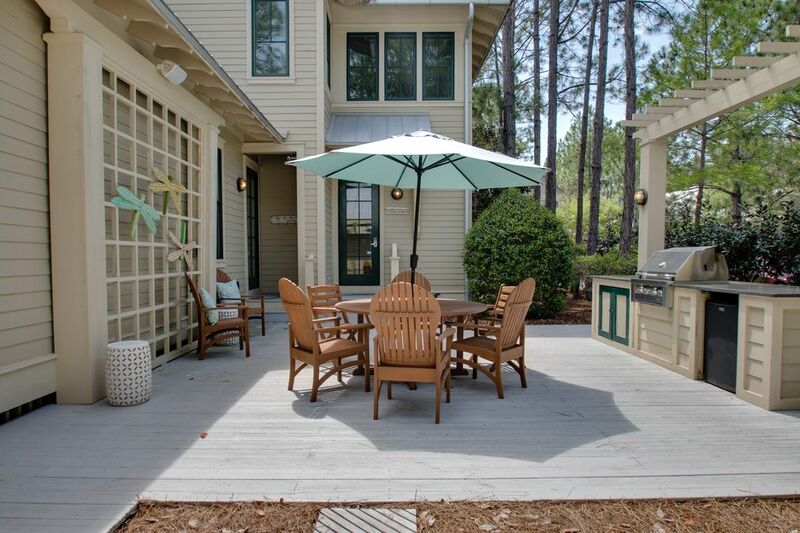 DETAILS: "Sunshine and Saltwater" is a luxury vacation rental ideally situated in WaterColor's Forest District. Featuring four bedrooms, three and a half bathrooms, two living areas and impeccably chic accommodations for up to ten guests, this beach abode offers the perfect spot to bring the whole family. On the first floor your will find the spacious living room, dining area overlooking the surrounding forestry and fully equipped kitchen which flow seamlessly from one another making entertaining on nights in a breeze! The master bedroom rests on the first floor and is completed by a private bathroom with a superb soaking tub and walk in shower. As you make your way upstairs you are greeted with the bonus living area that leads out to a sprawling screened porch overlooking Pine Needle Way. The second floor also offers an additional king bedroom suite and two guest bedrooms which share a jack and jill bathroom. The home's convenient location offers swift access to Publix for your grocery needs and Pizza by the Sea. When you're ready to get out and about, explore WaterColor and Scenic 30A on the bikes provided or head over to neighboring Seagrove and Seaside for superb shopping and dining options. Check availability and book today! *Unfortunately, the garage is not for guest use. Great house with nice sleeping arrangements and 360 blue does top notch job with any issues. Golf cart was great as well. We are so glad that you enjoyed your stay with us in Watercolor and that you had a positive experience with us at 360 Blue! We hope to be able to host you again in the near future! 360 Blue is not providing top notch service in watercolor and this was one of our least favorite homes in the 9 years we’ve been coming to watercolor. House was not cleaned to expectations, water leaking from ceiling, brutal pillows, toilet paper you’d expect to find in an elementary school and so on. We are so sorry you did not have a positive experience with us in Watercolor. We apologize for the lack of cleanliness at the home at the time of arrival, however, I do show that we sent our cleaning crew to correct the areas that were missed. In regards to the water leak, we do not show where that was reported by you and your group or the guest we had at the home thereafter. We take issues like cleanliness and leaks very seriously and would have done everything possible to correct it. We will share your feedback with our team to avoid this in the future. We hope you are able to visit our area again soon! This was our 15th summer returning to Watercolor. Our family of 6 had a terrific stay at 69 Pine Needle Way. The home was ready on arrival and spotlessly clean. We had a small issue with the golf cart not holding a charge on day 1, but 360 Blue responded immediately to resolve the issue, and the follow up calls were greatly appreciated. The home was well appointed for my wife and 2 teenage kids and senior parents; an outstanding value for the week! We are so glad to hear how much you enjoyed your vacation with us in Watercolor! We are so delighted that you and your family found this home to be accommodating for all and we agree that this home is a great family option! We look forward to seeing you and your family again very soon! My family's stay at 69 Pine Needle Way was absolutely fabulous!! The location was great - short bike ride to Seagrove beach (which wasn't crowded even in July), close to Seaside, Watercolor, and Publix! The crew at 360 could not have been more friendly, accommodating, and helpful. We will definitely return next summer. Magical!! We're thrilled to hear you had such a great stay with us in Watercolor! The proximity to Seaside and Seagrove really is one of the best parts of the location! Thank you so much for choosing 360 Blue, and for taking a moment to provide your valuable feedback for us. Be sure to come back and visit us again soon! Wonderful time in Watercolor in this amazing, comfortable home on Pine Needle Way. It's a great place to unwind and has all the amenities you can imagine. Looks like the perfect beach day! We are thrilled to hear you had such a great stay in WaterColor and you truly can't beat all the amenities! Thank you for staying with 360 Blue and come back soon! The house is beautiful, kitchen well equipped, yard kept up. We had a wonderful vacation. We are so happy that you had such a wonderful stay and enjoyed this beautiful home. We look forward to having you back soon!